Located on the western coast line and just below Pantai Cenang, Pantai Tengah is another beautiful beach area which is very dear to the tourists. It takes barely 20 minutes by car to reach the area from Langkawi International Airport. The beach here is as lovely as Cenang, has a lovely curvature and fringed by palms and coconut trees, and is a long stretch of white sands. Although there is a rocky cliff that separates the two great beaches, the only difference being Pantai Tengah Beach is not as crowded as the Pantai Cenang beach. While there are several chalets, mid range resorts and few upscale hotels along the beach, the number is far less than the Cenang area. So Pantai Tengah offers the tranquility and romantic ambience which is rare in Cenang. It is for this reason that this area is more favorite to young couples and families who are looking for quietness and at the same time access to a wonderful beach with water activities and other amenities. There are several operators in Pantai Tengah area and also kiosks on the beach that offer many water sport activities like parasailing, jetski, banana boating etc during the day time. Many of them also offer boating and island hopping tours. Kilim Geopark & Mangroves is probably one of the best tours in Langkawi and offered by the well known operators. Huts along the beach also offer Island hopping boat tours. Many charter cruises including sunset and dining cruises operate from a nearby jetty. The area is also full of Spas offering all kinds of therapies at reasonable rates. Another positive point about Pantai Tengah is the number and variety of restaurants on its stretch. You will get restaurants offering dishes including seafood, Indian, Japanese, Continental, Italian and of course local Malay food. For nightlife, there are bars, beach bars and even music lounges & discotheque in this area that remain open till late night hours. But if there is one thing missing in this area, that would be tourist places and sightseeing attractions. I don't really consider that to be a big negative though. Because you will any way need to hire a car or taxi, go around and see the attractions in the island. You won't get all of them in one place anyway. Also that the island itself is so small, it hardly takes any time to reach one place from the other. For shopping, while there is a shopping complex called Sun Mall that has several shops, restaurants and cafe, there are also several stores selling dresses, souvenir & gifts, accessories and essentials along the main street Jalan Pantai Tengah. Also note that the Pantai Tengah starts from where Pantai Cenang ends. So most of the stores and restaurants of Cenang are also easily accessible from Tengah. 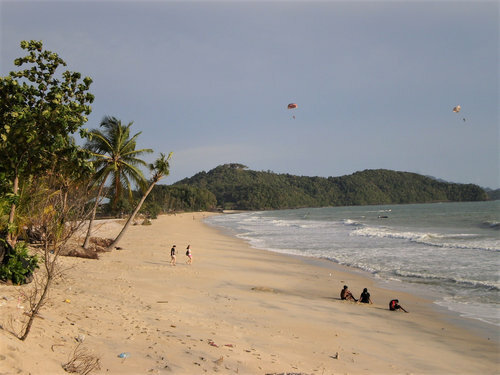 Hotels in Pantai Tengah: Several budget, mid-range and luxury resorts are located here. Attractions in Pantai Tengah: Mainly the lovely beach. There are a few great attractions in the adjacent Pantai Cenang Area. Activities in Pantai Tengah: Several Spa centers, fishing, boating, charter cruises and water sport activities operate from here. Top Restaurants in Pantai Tengah: Some great restaurants serving German-Malaysian, Indian, Iranian, Italian and Chinese cuisine are located here. There are also restaurants serving fusion cuisine and Japanese, Turkish, Spanish and seafood dishes. Nightlife in Pantai Tengah: The area is full of retro bars, lounges, music & discotheque, and beach bars. Several shops for handicraft items, home items, essentials, clothes, souvenir & gifts are located here. The most prominent of all is the Sunmall which has several bars, cafe, restaurants, spa, a handicraft outlet etc in the complex.